Frank O’Connor was part of a small group of forward-looking thinkers from Cork who embraced a variety of art forms. He was friends throughout his life with numerous artists and UCC has tried to reflect this by collecting artwork by his contemporaries. 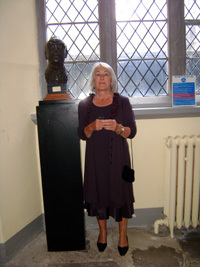 Not least of these is a bronze head of O’Connor by his friend, the Cork sculptor Seamus Murphy. A similar bust, that of O’Connor’s old teacher Daniel Corkery by Murphy’s father-in-law, Joseph Higgins, is also displayed on campus. Artefacts associated with O’Connor’s life are preserved at Cork Public Museum which is located adjacent to the UCC campus in FitzGerald’s Park. Please click here for more information. In recent years, O'Connor's daughter, Liadain O'Donovan, sold her 1949 portrait of O'Connor by artist Norah McGuinness and it is now held in the collection of the Crawford Art Gallery in Cork. O’Connor was the subject of a number of portraits by other artists in Ireland. One such portrait was a recently discovered photograph of a watercolour by writer Daniel Corkery in 1926. It is not yet known where this painting is located but the photograph was found by Dr. Hilary Lennon in Harriet O’Donovan Sheehy’s private collection of photographs. Mrs O’Donovan Sheehy has kindly given her permission for reproduction of the image for display on this website. Copyright of the photograph is held by the Frank O’Connor Estate. Daniel Corkery was O’Connor’s first literary father figure. His second father-figure was the poet AE (George Russell) and he completed a portrait of O’Connor in March 1930. 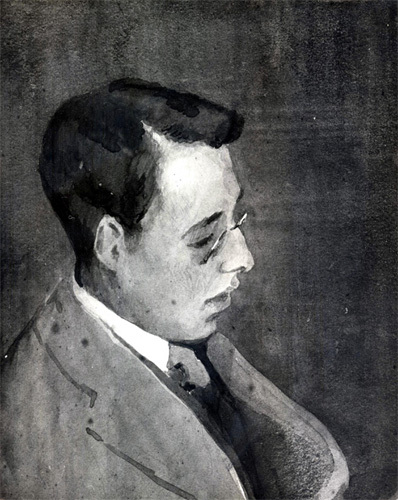 This charcoal drawing is held in Harriet O’Donovan Sheehy’s private collection and kind permission was also given by her to Dr. Lennon for the creation of a photographic image of the portrait for this website. of her father by artist Seamus Murphy.